The Side Hustle is told between alternating viewpoints – the detectives’ and Kirby’s. They’re racing toward a killer, neither knowing what the other knows. It’s an old-fashioned whodunnit featuring a bit of a hidden message. What’s that message you ask? Personal finance. And that’s the first reason I bypassed going through a publisher. Some basic financial principals are sprinkled throughout the book. How could they not be? A personal finance blogger was murdered, for God’s sake. It was a perfect opportunity to talk about how he lived his life. Trying to explain to a publisher what I was trying to do with the story might not be well-received. If you’ve read this blog, or any personal finance blogs, you’ll immediately understand what I was trying to accomplish with The Side Hustle. I kept the personal finance nuggets small. Sometimes they were so small that they were background or ambient noise. The goal was to share some personal finance wisdom in the middle of a crime fiction story. I was using the idea that a spoonful of sugar helps the medicine go down (a big thanks to Mary Poppins for that advice, by the way). I was interviewed at Wrong Place, Write Crime for The Side Hustle. check it out by clicking the picture. 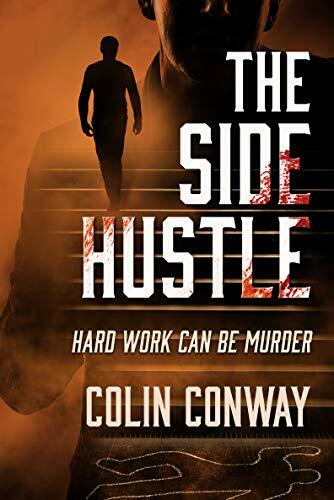 The second reason I decided to go the route of self-publishing was the title itself – The Side Hustle. I firmly believe that our enterprising sleuth, Kirby Willis, if he had written a novel, would self-publish it and get to marketing it himself. I couldn’t create a character such as him, then sit back and decide I should send it out to some publishers with the hope that some of them would get the idea. No, this one I needed to tackle myself. A novel takes an incredible amount of time to write. As the followers of my blog, Building-Income, have no doubt noticed, I’ve stumbled on keeping up with my weekly writing the latter part of this year. That was notably due to getting The Side Hustle ready for publication. There is other book news and more posts on the way, but that is for another time. Today, I just wanted to get you up to speed on this project as we move forward into the future. *By the way, for those of you wondering what the graphic of dancing people has to do with this article, “The Hustle” was a song from Van McCoy & the Soul City Symphony that reached #1 on the Billboard charts in 1975. It was a huge dance craze. “Do the hustle,” were essentially the only words in the entire song. How’s that for a throwback music reference?